100% Renewable Energy – Our priority campaign this year is working to tackle climate change by moving to 100% clean, renewable energy in our state. 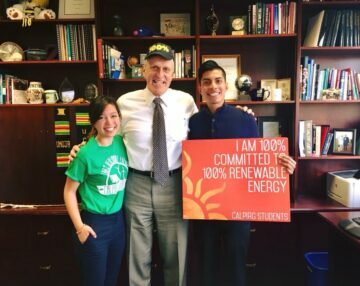 The state legislature is considering a bill that would commit CA to a 100% clean energy future, but we need to show them overwhelming support to get the bill passed. This quarter we collected 10,900 petitions in support, signed on 80 other student organizations, and joined 100 students from across the state for our Annual Lobby Day to meet face to face with our legislators. We also held educational events on campus including a solar-powered concert at UC San Diego. We’re getting closer and closer to victory, but need to keep the pressure on to see this historical legislation through the finish line. Making Textbooks More Affordable – We’re also working to make textbooks more affordable by promoting online educational resources while also educating faculty on the burden caused by online access codes that require payment to access homework online. This quarter we released a new report, investigating those high textbook prices at schools across the country. Entitled Open 101: an Action Plan for Affordable Textbooks, the report contains recommendations that could save students billions of dollars by ensuring the textbooks they buy for general education classes are free instead. Stopping Offshore Oil Drilling – This year the Trump Administration proposed new offshore oil drilling. This drilling endangers sea life including whales, dolphins, and sea turtles, as well as the life and livelihoods of Californians and all Americans in coastal communities. We generated over 600 public comments to the Bureau of Ocean Energy Management and organized 45 students to attend a rally in Sacramento earlier this quarter. Alleviating Hunger on Campus – With the tuition and rent costs in our college communities increasing, food insecurity among college students is becoming an increasing problem. Students shouldn’t have to go hungry, we’ve been teaming up with campus food pantries to fundraise for meals for students in need and held service events on Martin Luther King Day of Service. Banning Toxic Chemicals in Cosmetics – We should be able to trust that the products we buy are safe — especially ones we use every day, applied directly to our lips. But we’ve found that many popular lipsticks and lip balms contain ingredients linked to cancer, hormone disruption, and reproductive problems. We released a new consumer guide this Valentine’s Day on lip products to avoid and safe alternatives. Saving Bees – Bees pollinate nearly seventy percent of the world’s food and they are facing mass die-offs. So we’ve been working to ban bee-killing pesticides. 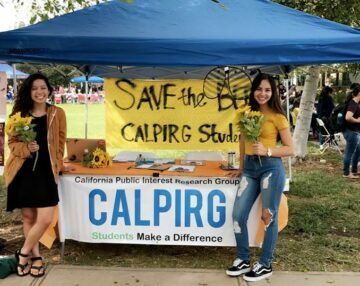 We’ve been educating students on the issue and working to get campuses and cities to commit to being bee-friendly. Last year we succeeded in getting the town of La Jolla to pass a resolution in support of being bee-friendly. 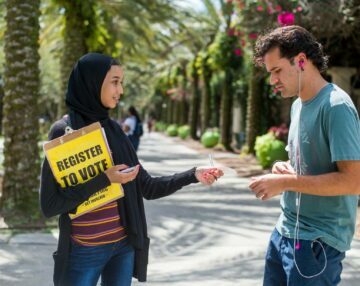 This year we’re working to get San Diego, Berkeley, and the UC campuses to do the same and through just a few events have generated 1600 petitions in support.